Accompanied by bassist, David Lee. 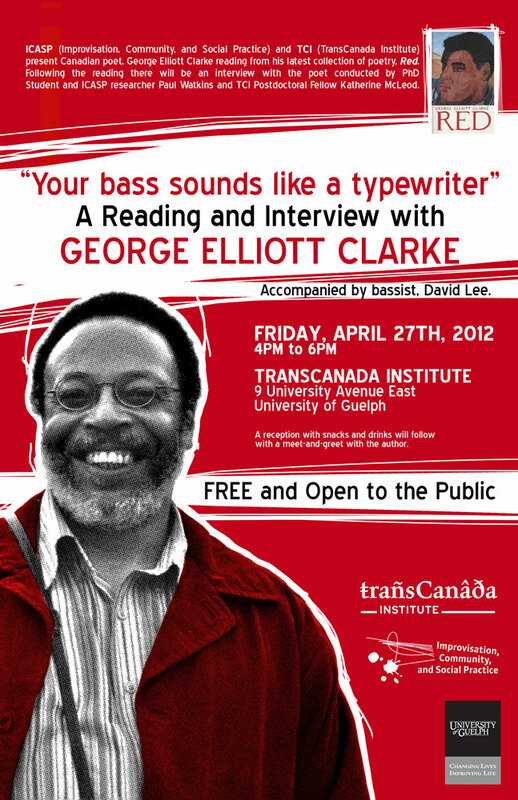 ICASP (Improvisation, Community, and Social Practice) and TCI (TransCanada Institute) present Canadian poet, George Elliott Clarke reading from his latest collection of poetry, Red. Following the reading there will be an interview with the poet conducted by PhD Student and ICASP researcher Paul Watkins and TCI Postdoctoral Fellow Katherine McLeod. A reception with snacks and drinks will follow with a meet-and-greet with the author. Get signed a signed copy of Red directly from the author for only $20! 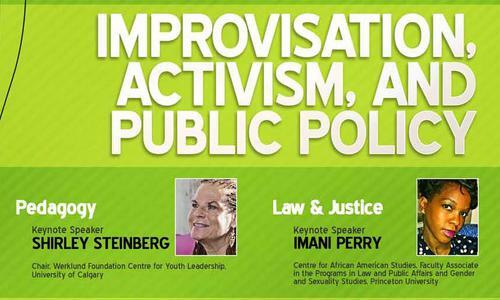 The 2012 edition of the colloquium will focus on the relationships between social responsibility, social justice, and improvisation as reflected through various musical genres. Beginning with the notion of the paradigmatic possibilities of jazz improvisation, the colloquium will explore how improvisation, as pedagogy and as paradigm, create spaces of praxis that operate as socially responsible and social justice-oriented practices for human life. How might we envision a social praxis indebted to the poetics of improvisation that operates as an emancipatory form of human knowledge and life? Acknowledging that a deep social engagement with the paradigmatic possibilities of improvisation might dramatically alter our present knowledge system, do theoretical analyses of improvisation’s pedagogic possibilities present us with socially responsible tasks as scholars, performers, and citizens? When you listen to music coming from the schools and universities, it’s like they’re all speaking the same language because they’ve all been taught like we’re in a Ford factory or something. That is really not the way for music to be perpetuated. And if I stand up here and tell you what the sound should be or how to do this or that, or that “jazz” is so-and-so, or how to move from this chord to that chord, or if somebody tells you how to do something and you don’t really know how to do it yourself, then there’s something wrong. You’re doing what they told you to do when in reality you have to figure every thing out for yourself. -Henry Threadgill in conversation with Daniel Fischlin. Read the full interview here. 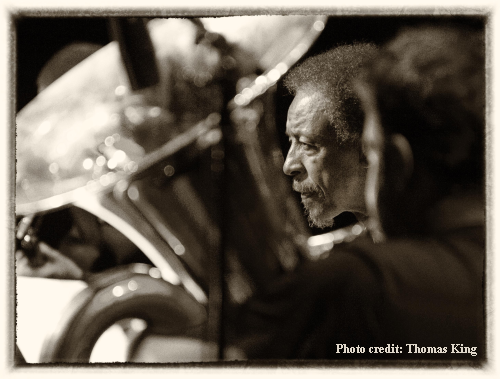 Henry Threadgill, (born February 15, 1944, in Chicago, Illinois) is an American composer, saxophonist and flautist who came to prominence in the 1970s, leading ensembles with unique instrumentation and often incorporating a range of non-jazz genres. Last year he performed with his Zooid at the 2010 Guelph Jazz Festival. 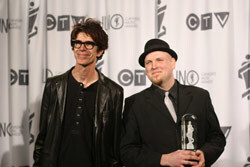 Guelph Graduate, ICASP researcher, and Jazz Festival Mainstay Wins Juno! University of Guelph graduate Jesse Stewart has won a Juno Award for Instrumental Album of the Year with his band the Stretch Orchestra. The annual honours were handed out Sunday night in Ottawa. Stewart, an accomplished jazz percussionist, composer and artist, is a two-time U of G graduate, who completed a BA in 1993 and a PhD in literature/theatre studies in 2008. He also has two master’s degrees from York University. Heble and Stewart produced a CD together called Different Windows, a percussion-piano duo, and worked together on the Guelph Jazz Festival, which Heble founded in 1994. Stewart was the festival’s assistant artistic director for many years and has performed numerous times at the festival. He is currently a professor in the School for Studies in Art and Culture at Carleton University. Bringing together scholars, dancers, turntableists, MPC beat performers and MCs, “Improvisation is Something We Live” was a place where hip-hop culture, co-opted and negotiated by performers improvising in real time, was reconnected as both a "new" and "old" phenomenon. This productive reconnection to both "old" and "new" ways of performing hip-hop happened not only among the performers and presenters, but also among the audience who collectively set the scene for a daylong conversation on culture, and the performing arts. The scholarly presentations thickened the sense of community, tackling social issues and sharing ideas on education initiatives. 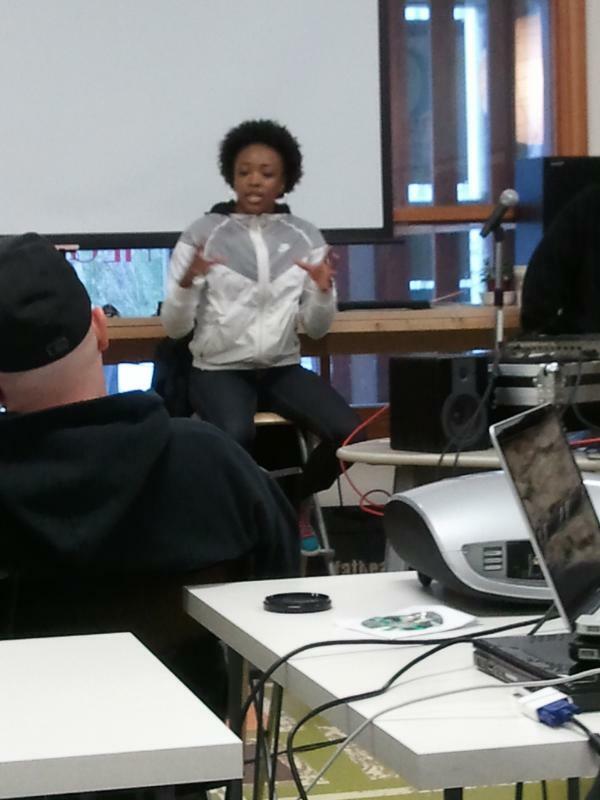 Charity Marsh’s talk gave insight into the value of musical expression for children, youth, and adults alike. Marsh’s efforts and research with children, rooted in the hip-hop aesthetic, gave the genre and its improvisational themes a strong case for social progress. Battle performance, in its competitive yet comical character, was brought to the discussion by several of the day’s performers. Embodying the humour of the hip-hop battle, Fresh Kils showed us how to make a sampler a riot to watch with his highly animated and exuberant musical gestures. While the day saw dance, freestyle rapping, and other aspects of the hip-hop genre, closing the conversation and typifying the improvisational aesthetic was turntable artist, SlowPitch. Using a collection of DJ and music production tools, SlowPitch pulled records from his crates, letting each record inspire the directions of a real-time soundscape performance – and doing so with big beats! 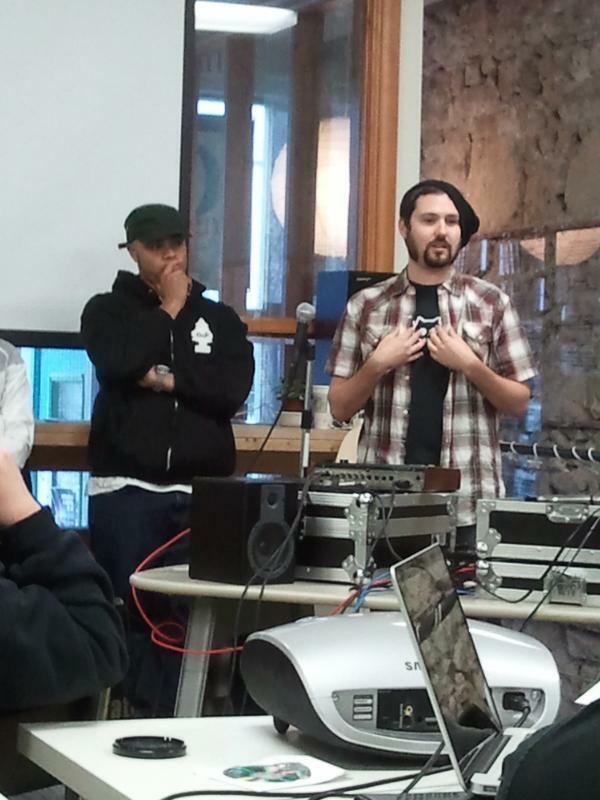 “Improvisation is Something We Live,” was a symposium that reminded its attendees how important community is for music to thrive, and how much art and intellect can come from hip-hop culture. Trilok Gurtu is a world class virtuoso percussionist, whose work has blended the music of his homeland with jazz fusion, world music and other genres. Trilok Gurtu was born into a highly musical family in Bombay, India where his grandfather was a noted Sitar player and his mother, Shobha Gurtu, a classical singing star and constant influence. He began to play from the very young age of six. Trilok Gurtu began playing western drum kit in the 1970s, and developed a stong interest in jazz. He has attracted a world-class set of collaborators over a long career, including John McLaughlin. In 1988 Trilok met The Mahavishnu Orchestra and its leader, McLaughlin, and for the next four years played an integral part in The John McLaughlin Trio. He has also played with Joe Zawinul, Jan Garbarek, Don Cherry, Bill Evans, Pharoah Sanders, Dave Holland, Asian Dub Foundation and Nitin Sawhney. In 1993 Trilok toured his own trio in support of the album The Crazy Saints, which featured not only Joe Zawinul, but also Pat Metheny. His latest project/ release (21 Spices, 2011) is a collaboration between him (Gurtu composed all of the material), drummer Simon Phillips, and Germany's NDR Big Band; also on board are Michel Alibo on electric bass and Roland Cabezas on electric guitar. With this lineup, the result is a fusion album with a strong world music influence, sounding somewhat Weather Report-ish in spots, only with the muscular horn section that the NDR Big Band brings to the table. Trilok has garnered a number of prestigious awards and nominations, including Best Overall Percussionist winner, Drum Magazine, 1999; Best Overall Percussionist winner, Carlton Television Multicultural Music Awards, 2001; Best Percussionist winner, Down Beat's Critics Poll for 1994, 1995, 1996, 1999, 2000, 2001, and 2002, among other prestigious honours. *Performing a solo drum set live. Recently, I had the privilege of attending the 18th annual Leeds International Jazz Education Conference. The conference took place at Leeds College of Music from Thursday 29th to Friday 30th March 2012, and examined Jazz Practice in the 21st Century: including research addressing education, performance and composition. It was a unique forum for musicians, academics, educators, students, and arts organizers to engage with the latest sounds and ideas in jazz. There were a variety of presentations, workshops, performances, jam sessions, and a wide range of opportunities for discussion, international networking, and professional development. Even though my specialization is in English Literature, and most of the presenters were musicologists or jazz musicians, I think that my interest in pedagogy was similar to that of other academics or educators in attendance: to form new epistemologies and to actively make sense of the world. For me, music—whether in performance or in listening—is a malleable activity about making sense of the world, and not a “fixed” product. I agree with Christopher Small’s assertion, in Musicking, that “There is no such thing as music. Music is not a thing at all but an activity, something that people do.” By considering the record as text, and by also considering modern technologies such as the iPod, I conflated literary texts (particularly Ralph Ellison’s Invisible Man) and music (notably Louis Armstrong, and Ornette Coleman)—and did so through the use of a sampling device (MPC 1000)—to examine (and enter into) an improvisatory space where text and music meet to create poetry. I was surprised, and humbled, by how more traditional jazz practitioners were open to and engaged with my more experimental presentation. One of the great highlights of the conference for me, and assumingly many others, was the keynote presentation by Indian-born musician Trilok Gurtu, who discussed his own musical journey within and outside various jazz circles. 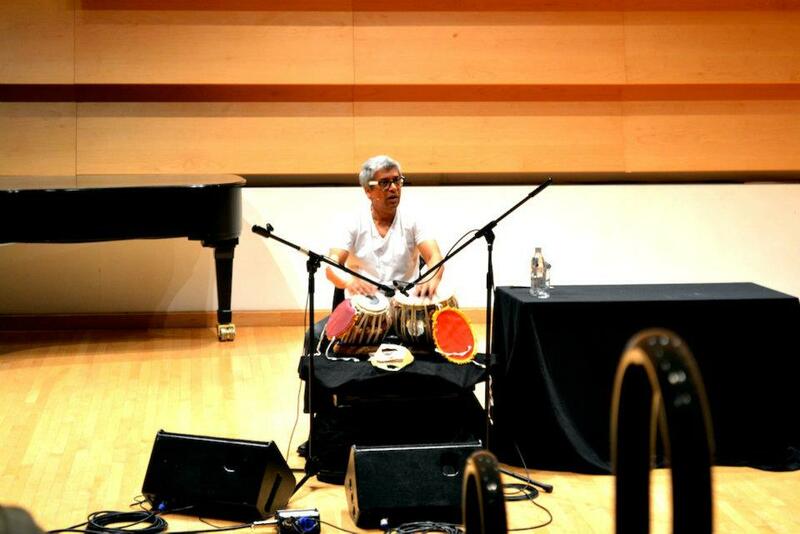 He presented his keynote along with his tabla (a popular Indian percussion instrument of the membranophone family, similar to bongos, used in Hindustani classical music and in popular and devotional music of the Indian subcontinent). Later that evening he performed a solo performance on the tabla, drum set, cajon, and various other percussive instruments. 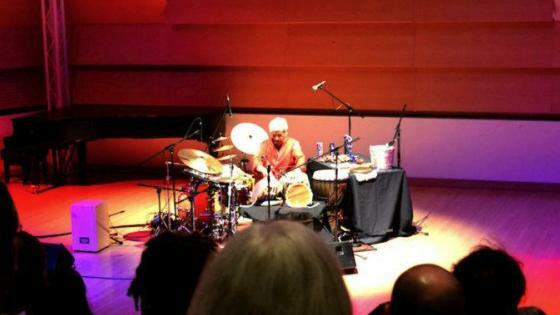 Trilok Gurtu is also this month’s featured artist, so please do have a listen to some of his music. Friday concluded with a performance from the National Youth Jazz Orchestra (NYJO) in Concert. NYJO is famous for showcasing some of Britain’s best young musicians. Since NYJO’s founding, by Music Director Bill Ashton OBE in 1965, many of the current generation of renowned British jazz musicians have risen through its ranks, often becoming established jazz stars whilst still playing with the band. One of NYJO’s aims is to share the talents of exciting young players with as wide a potential audience as possible. 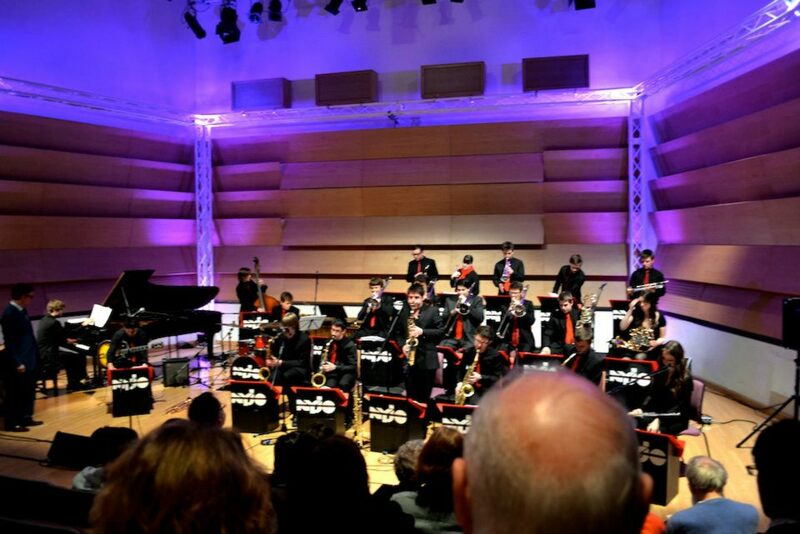 I was particularly impressed by the wide-ranging repertoire of the NYJO, who moved from reinterpretations of Duke Ellington to original modern compositions by students from Leeds College of Music, as well as student compositions from within the band. All in all, it was an exciting international conference, and one that I am happy to have attended. It was also a great opportunity to continue to spread the word about the ever-expanding ICASP project. If you attend a second jazz/improvisation conference next year, aside from the top-notch Guelph Jazz Colloquium in September, the Leeds International Jazz Conference is certainly worth looking into. Intended for students and scholars who have an interest in musical improvisation and its potential for dynamic forms of community building, the biennial Summer Institute marks the emergence of a new field of interdisciplinary work that promotes vibrant exchange and encourages new, socially responsive forms of community building across national, cultural and artistic boundaries. This year’s graduate level courses will explore the material effects that critical studies in improvisation can have on North American society, with an emphasis on the research themes: law and justice, pedagogy, and social policy. Two courses are offered at the Institute, each of which awards a certificate of attendance. In some cases university credit is possible. Participants will also be given the opportunity to present their work at special sessions of the Guelph Jazz Festival Colloquium (September 5th-7th, 2012) and will be encouraged to submit their papers to the peer-reviewed journal Critical Studies in Improvisation / Études critiques en improvisation (www.criticalimprov.com). See website for further details about the application process. As part of the McGill ICASP community, you are invited to participate in the upcoming colloquium to be held at McGill on Thursday, May 3rd. Fred Frith, world-renowned performer, composer, improviser and teacher will join us at McGill to listen to student presentations from all universities, and to have an informal lunch discussion with the McGill group about the changing place of music improvisation in universities. 9:30-11:30 Presentations (teleconference): Students from the three institutions are encouraged to present a short description of their current research, followed by comments from Fred Frith and discussion with other students. 11:30-1:00 Lunch Discussion (offline): All are invited to participate in a lunch discussion with Fred Frith concerning the place of improvisation pedagogy in university music programs in North America. At the same time, UBC and Guelph will be discussing this subject over lunch. 1:00-2:30 Panel (teleconference): Once again reconvening online, we will report and elaborate on our lunch discussions with the hope of reaching some concrete ideas concerning the rethinking of musical pedagogy in university music programs. Please RSVP by April 24th so that ample lunch may be provided! Details about Le Cinémathèque québécoise gig will follow soon: Fred will perform a live improvisation with Peter Mettler (cinematographer/visual improv).